A full ice transition drill. The drill starts with the three F’s (in black O’s in the neutral zone) attacking the offensive zone 3v0. They attack the blue line, make a play behind the net and then get a shot. The as the O forwards attack the net, the X players (green lines) step out and simulate a neutral zone regroup (started by the coach). The O defensemen gap up and play a 3v2 rush vs the X forwards with the X D joining. After the O forwards get a shot on net, they backcheck the play into defensive zone coverage. Now the X’s and the O’s play 5v5 in zone. The drill creates a transitional sequence offensively (neutral zone play) and defensively (backchecking from a shot on net). It forces the players to play in situations that arise naturally in a hockey game and make the correct reads and decisions. A multiple element transition drill. The drill starts with the three black XF’s and one black X D attacking the two red OD with the one red OF backchecking. On a pass, the three XFs attack 3v2 with a backchecker and X D trying to jump into the play (3v2 +1/1 rush). The rush plays out, then goes into a 3v3 down low (X D is done after rush). Two new D wait in NZ, two red F’s move into the zone above the circles (they cannot be defended). When the red team gets the puck, they pass to the forwards and active a new 3v2 +1/1 rush (down low F joins, weak D activates and one XF backchecks). It becomes a continuous drill. The down low forward has a larger workload in this drill – two rushes and one backcheck. It is important that everyone works through the down low segment of the drill. Additionally, you could move the “safe zone” forwards back to the far blue line to create a longer skate for them. Simple DZ practice drill this week. X’s (offensive team) start at the tops of the circles/hash marks (F/D). O’s (defensive team) start on the blue line. On the whistle, each group skates to the next line up ice and then plays 5v5. A coach places a puck in the defensive zone where the O’s have to Backcheck to D Zone Coverage and then sort out their positioning and how they will play the situation. The X’s pick up the puck and set up in their offensive zone formation. This drill is for D Zone reps and getting players to understand where they backcheck to. It also helps them to figure out where to play positionally and how to sort out messy situations in their own zone. It can be controlled as much or as little as you want – place pucks in certain areas, stop the drill to teach to the team, etc etc. 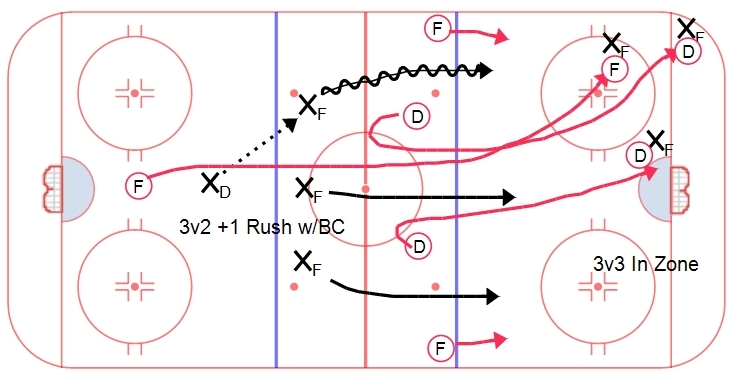 This drill starts with three red F’s going 3v2 on two blue D. When the rush plays out, a coach blows the whistle and plays a second puck into the neutral zone. Three blue F’s come off the bench to forecheck the puck while the red players attempt to regroup and counter attack. The puck is regrouped and then red attacks the zone 5v5 while blue backchecks to proper defensive positioning. Play can continue as long as desired in the zone, once blue gains possession, they breakout and attack 3v2. The drill then continues, with two new blue D regrouping on the next whistle. Players must focus on a number of execution points throughout the drill. First, they must properly execute a 3v2 rush on both sides of the puck. 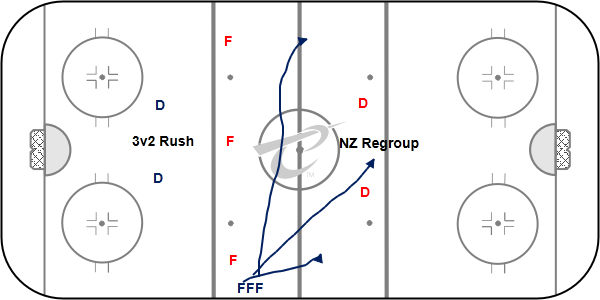 Second, players need to work through a neutral zone situation (counter attack and nz forecheck). 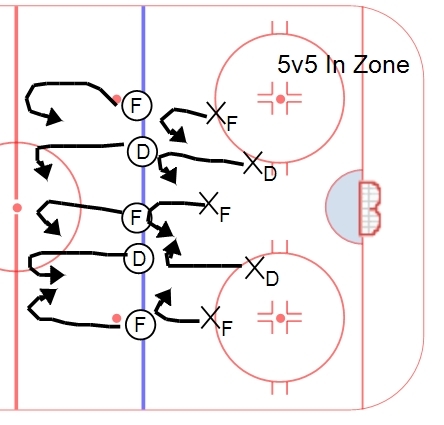 Finally, a transition to defense/5v5 zone play segment ends the drill for one group. As a complete entity, the drill works different in-game scenarios for every player on both sides of the puck. These days, the sport of hockey is all about Transition. Offensive Transition, Defensive Transition, Transition Transition. OK, I’m kidding about that last one, but winning hockey games often comes down to winning the transition game. Offensive Transition is the action of moving from defense to offense. It involves quickly changing directions and attacking off of a loose puck or a turnover. Players must recognize the opportunity to generate a quick attack or an odd-man rush. Offensive Transition often involves a quick first step and explosive speed, as well as defensemen jumping into the play and players using open ice. Head-manning the puck, area passes, indirect passes, slant support, and middle lane drive are all important concepts to master in Offensive Transition. Teams that are good in Offensive Transition attempt to catch their opponents moving the wrong direction and take advantage of players caught up ice. Just as O-Transition involves moving to offense, so does D-Transition involve the process of moving from Offense to Defense. Similar to O-Transition, Transition to Defense involves a quick first step and explosive speed. D-Transition also involves effort and will power. Communication, awareness, play recognition, stick skills and tie-ups are crucial to successful Defensive Transition. Teams that excel in defensive transition play with a sense of urgency and are effective at reading the play and taking away the most dangerous option for their opponents. In D-Transition, it is often not the first or second man back that makes the difference, but the third or the fourth player making an effort or failing to pick up their player on the backcheck that is the difference between a harmless rush and a goal against. Why is Transition hockey becoming so critical in hockey today? Players are getting faster, stronger, and more explosive and the game is moving up and down the ice at a quicker pace. This has forced teams to be better at defending the rush, which has resulted in more opportunities to transition to offense. The transition game is similar to the chicken/egg argument – does good D-Transition lead to O-Transition or is it the other way around? Either way, it is imperative that teams excel in both areas and have great first step quickness and explosive speed. Get coachchrishall.com in your Inbox! Where do I fit in the world?